Jet Airways on Saturday cleared the pending salaries for December, but pilots maintain they would stop flying from April 1 if full dues are not settled. The pilots’ union has called for a meeting on Sunday to decide further steps. The airline is yet to pay full salaries for January and February to its pilots, engineers and senior management. So far, only 12.5 per cent of December salary was paid and on Saturday the airline credited the remaining 87.5 per cent for the month. “The board of directors and the management team are working as fast as possible to implement the resolution plan agreed with the consortium of Indian lenders to quickly restore the much-needed stability to our operations and build a sustainable future for the airline,’’ chief executive officer Vinay Dube said in an email to staff. Stating that these are complex processes and that it has taken longer than expected, Dube wrote, “We are only able to remit your remaining salary for December 2018”. 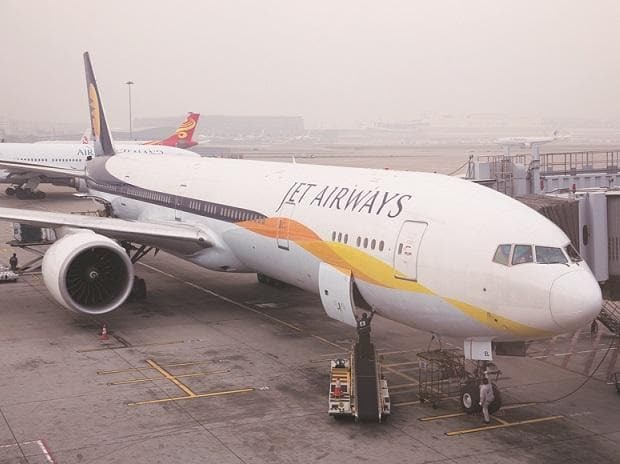 Founder Naresh Goyal stepped down as chairman of Jet Airways on March 25 as lenders agreed to provide Rs 1,500 crore in emergency funding as part of a resolution plan. His wife, Anita, too, resigned as director on the Jet board. “We realise that this remittance does not lift the financial hardship that each of you are facing and we do not take your sacrifices for granted. We continue to work on additional funding on an urgent basis and shall advise you about the release of the remaining salary arrears as the funds come in,” Dube has told the Jet staff in his latest email communication. The pilots’ union has made it clear that the partial payout is not acceptable. “There will be no flying unless the company pays us substantial salaries and provides a road map,” the National Aviators Guild, the pilots’ union, said in a message to its members. Just a day ago, around 200 pilots had individually written to the airline CEO, threatening to go on leave of absence and warning of legal action for non-payment of dues. Engineers too have threatened to stop work if salaries are not paid. Lenders’ consortium is preparing for an open auction for Jet, which has a debt of around Rs 8,500 crore. The expression of interest for the auction is likely by April 9 and final bids are expected by end of May. Goyal, whose stake has been halved from 51 to 25.5 per cent is learnt to be scouting for strategic partners for the airline he had founded more than 25 years ago. Abu Dhabi-based Etihad, which owned 24 per cent in Jet and now is left with 12 per cent, is expected to decide at a board meeting on Sunday, whether it wants to exit the airline completely or not.